Are you a KACE Systems Management Appliance user? Do you use the Service Desk within your SMA to manage your IT Support? Would you like to see your ticket data in Dashboard format, on a big screen, hand held or desktop device? 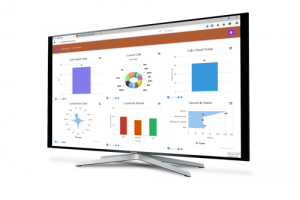 DASHboard is available as a local appliance solution or as a cloud solution if you prefer. Ticket data is passed via the standard ODBC connection from your KACE SMA to your DASHboard and is then reformatted so that the data is presented in views that make sense to your Service Desk and support resources, and then made available to your staff via your own customised URL. From within each graph you are able to view the underlying data that makes up the chart, print out the data or click on ticket references to link directly through to your KACE SMA. If you require a graphic or Metric that is not currently available from the list, then we are also able to build custom graph components to add to your DASHboard. Can I test the DASHboard before I join the Program?